We all know Sinatra as a lightweight alternative to Rails. I find using it is a real pleasure. Sinatra’s helper methods, template support and routing provide just enough to get a simple web site running quickly, but then immediately get out of your way. Years after it was introduced Sinatra remains one of the most popular Ruby web frameworks out there. This week I decided to take a look inside of Sinatra to see what I could learn from the way it was written. I expected to find sophisticated, well written code that effectively implemented Sinatra’s API. What I didn’t expect to see was code written with a real sense of style and polish… Sinatra’s internals live up to the name! # Run a route block and throw :halt with the result. Huh? What’s going on here? The yield statement makes sense: since the client provides the route code as a block, Sinatra needs to yield to it. But what is the throw statement doing? And what does :halt mean? Is my route block somehow returning an error or exception? And where is it thrown to? Before understanding what throw is doing here, we need to review how throw and catch work in Ruby, and how they are different from raise and rescue. I won’t spend time here today explaining that since Avdi Grimm wrote a fantastic article about exactly this question last Summer: Throw, Catch, Raise, Rescue… I’m so confused! He even used Sinatra as one of his examples. In a nutshell, Avdi explained that despite the different names, raise/rescue should be used to handle exceptions, similar to try/throw/catch in C++, Java and other languages. In Ruby, on the other hand, throw and catch are intended to be used as another program control structure. # Run the block with 'throw :halt' support and apply result to the response. 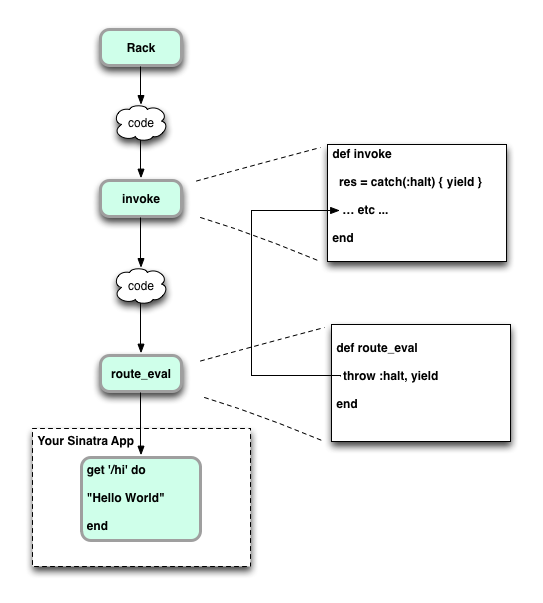 Ruby sets the catch block’s return value to the second argument passed to throw – your route code block’s return value in this case, or res in the diagram. The big benefit here is that when the client code decides to call redirect, Sinatra avoids the need to execute everything following the redirect call (“… lots of code here…”) – or the need for the client code itself to have to use an if/else statement to avoid executing it. Sinatra has taken what should be a normal, mundane Ruby programming task – calling a code block – and done it in a stylish, elegant way. The result is faster, cleaner code, both for Sinatra’s internals and for you! Something else in Sinatra’s internals that caught my eye was the way it used Test::Unit. Many Ruby developers today prefer to use RSpec or Minitest instead of Test::Unit to get a more powerful and readable DSL for unit tests and BDD. But Sinatra, like the Rails core team, uses plain old Test::Unit for its test suite. Wow – that’s so simple and easy to read. Here Sinatra is also taking advantage of the excellent Rack::Test library by Bryan Helmkamp, which provides the Rack::MockRequest object. Sinatra has DRY-ed up its test suite substantially using these two helper methods, along with other, similar methods. Not only is Sinatra’s test suite easier to read for this reason, but it’s also easier to maintain. In my own personal projects I often don’t apply the same amount of love and attention to my test code as I do to my production code – there’s definitely a lesson to learn here! # extension will be created and registered on the fly. While this might be a bit hard to understand at first, it’s actually fairly straightforward. 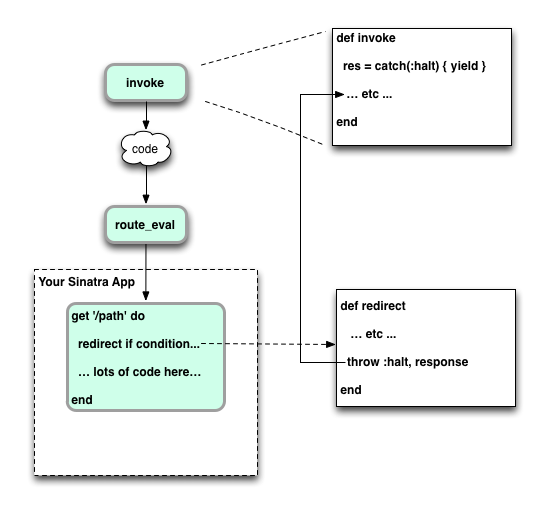 The client code (your Sinatra app) passes in an extension, like the call to register LinkBlocker we saw above. Next this extension module is added to an array called @extensions and then Sinatra iterates over the array and extends itself with each extension. This sounds fairly mundane and simple – I would have used much simpler code than this to do that same thing! What else is going on here? First, the use of *extensions instead of just extension. This allows the client code to pass in a single extension, or a list of extensions as desired. This is a very common Ruby idiom, and Sinatra makes good use of it here. Next, notice the line of code containing the call to Module.new. This is more subtle and interesting. Here Sinatra is allowing the client code to pass in a block instead of, or in addition to, actual modules. If a block is given by the client code (block_given?) then Sinatra creates a new, anonymous module right on the spot with the block! Then it adds the anonymous module to the extensions array. This gives the client code the flexibility to pass in actual modules and/or anonymous blocks of code. Finally, notice the line near the end that calls respond_to?. What’s this all about? Well, here Sinatra checks whether the new extension module contains a method called registered. If it does, it calls that after applying the extension. This gives the client code the option of implementing the registered method if it needs to take some action at this point. By paying attention to these minor metaprogramming details, Sinatra has added a lot of flexibility to the register method and made the client code’s job easier. You can find similar examples of this in other metaprogramming employed elsewhere in Sinatra’s code base. All of these are all fairly minor details, but in my mind they raise Sinatra’s internal code from something normal and ordinary up to a higher level – to be something stylish and exceptional. The Sinatra developers weren’t satisfied with building just another web framework. They wanted to build something special that people would love to use. And the way they achieved this was by paying attention to the small design and code details that most Ruby developers – like me – would probably ignore.